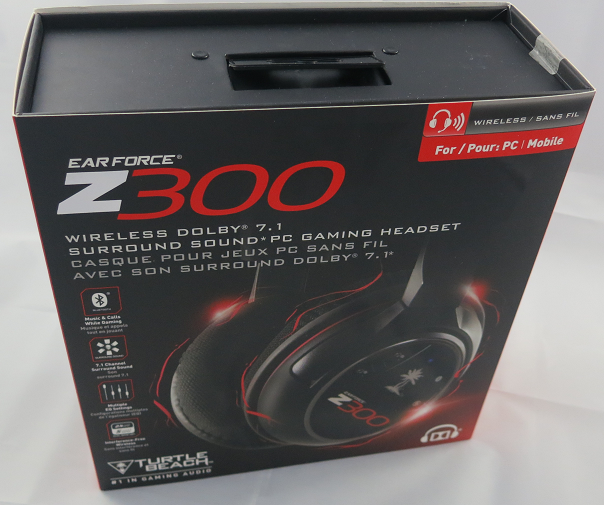 The Turtle Beach Z300 is a super flexible gaming headset, with wired and wireless connections, Dolby 7.1 virtual surround sound, and extra features like switchable dynamic range compression. It is primarily for PC gaming, but also works with Mac (no Dolby surround) and with any Bluetooth-compatible device – which means almost any smartphone or tablet. You can also use the wire to plug it into any device with a 3.5mm audio jack. In the box you get the headset, detachable microphone, USB cable, jack cable, USB transceiver, and some documents including a note about having to download the Dolby 7.1 drivers. I still recommend downloading the online manual, which is more detailed than anything in the box. Wireless via a USB transceiver. This is the preferred method for a PC. The USB transceiver is pre-paired and indicates via an LED whether or not the headset is connected. Traditional wire. A jack cable is supplied which connects to the left earcup and has a standard four-way 3.5mm jack on the other end, suitable for a phone or tablet. In wired mode you still need to charge the headset and have it powered on. Bluetooth. You can pair with up to two devices. The right earcup has Bluetooth volume controls, and a Bluetooth button for answering, rejecting and ending calls. The actual headset seems sturdily made and features a fabric-covered headband and earpads. The material feels slightly coarse at first, and the earcups are slightly on the small side, but in practice I found the comfort reasonable. The microphone is on a flexible boom and is detachable. You can also swing it up above the left earcup to get it out of the way. You charge the Z300 via a mini USB port on the right earcup, which annoyingly is the old type, not the slightly smaller one now found on most phones and tablets. A cable is supplied, though it is too short to reach from the floor to your headset if you are wearing it, and in my case too short even to reach from the front panel of my PC. You might want to get a longer cable if you expect to charge while wearing. Play time is specified at 15 hours. An annoyance: there is no indication of remaining charge. Power on/off on the left earcup and easy to find by feel. The headset automatically powers off after 5 minutes of inactivity. Master volume on left earcup. Mic monitor volume on left earcup. This controls how much sound from the mic is fed back to your. It does not affect the volume heard on the other side. Tone on left earcup: cycles through 4 “game modes”. These are Flat, Bass boost, Treble boost, and Bass and Treble boost. I generally used the Flat mode for this review. Dynamic Range Compression on left earcup: raises the volume of quiet sounds. The effect seems minimal to me. Bluetooth controls on right earcup: as mentioned above. If you use the USB transceiver and a Windows PC you can insteall a Dolby 7.1 driver. Note: these are stereo headphones, but when used with this driver they support Dolby’s virtual surround system. You enable this by going into the Windows sound properties dialog (eg right-click the speaker icon and choose Playback Devices), then showing the properties dialog for the Turtle Beach speakers. 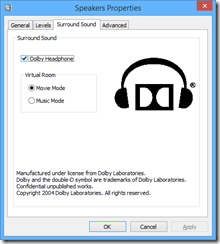 A surround sound tab then lets you enable “Dolby Headphone”. You can also choose between two modes: Music or Movie. Enabling Dolby Headphone makes a substantial difference to the sound. It is distinctly louder, and the sound seems to fill out more. On games with true surround sound, the virtual sound should mean that you get spatial clues about the source of an explosion or footstep, for example, though you need to make sure the game is set to output in surround sound. I tried this and reckon it works a bit. It is not as good as a headset I tried that really did have multiple speakers. 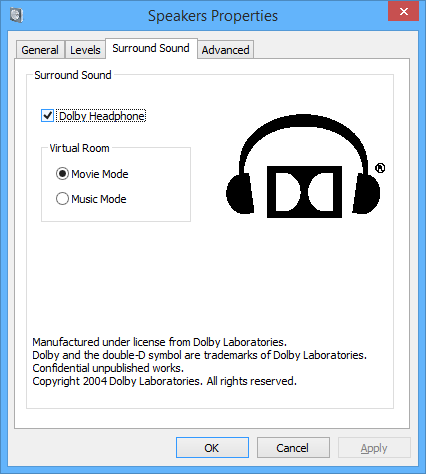 My big gripe though is that if you enable Dolby Headphone, it messes up true stereo, for example on music. You no longer hear the mix as intended. This would not matter too much if it were easy to switch Dolby Headphone on and off, but it is a hassle to go into Windows sound controls every time. I would like to see more effort go into usability. How about the sound quality? Here is my second big gripe about this headset. The sound is not great, with anaemic bass and a nothing special in the mid-range or treble. For gaming it is not too bad, and I did find the audio atmospheric if you can live without much bass thunder, but for music they are not good enough. The microphone quality is fine. I tried the headset with Dragon Dictate, just to check the quality, and got high accuracy of transcription which is a good sign. In summary, the flexibility is exceptional, the build quality is fine, but the sound is lacking. Personally I would not use these as my main headset because I do both gaming and music listening; but if your main use is gaming they would be OK.
Price is around $170 or £170 (better value in the USA it seems). If headphones are judged on versatility, the Jabra Revo wins the prize. It works wired and wireless, it’s a USB audio device, it’s a headset with remote control, and as a final flourish it folds into a moderately compact size that you can slip in the supplied bag. You might think that the result of this flexibility would be a fiddly and complex device, but this is not the case. The Revo has an elegant design and looks modern and sleek. The construction feels high quality as well; these headphones are lovely to handle. In the solid plastic box you get the headphones, a drawstring bag, a USB cable, an audio cable (with four connectors on each 3.5mm jack, suitable for a headset connection to a mobile phone or tablet. The cables are braided for tangle-free connections, and bright orange so you will not miss them. There is also a “Getting started” leaflet which I recommend you read, since not everything is obvious. Step one is to charge the headphones. This is done using the USB cable. No charger is supplied, but you probably have a few of these already, or you can plug into any PC or Mac. A red light comes on while charging, and turns off when charging is complete, which takes about two hours from flat. Step two is to pair the headphones with your mobile device. For this you can put a three-way on/off/pairing switch, tucked under the right-hand earphone, into the pairing position, for pairing in the normal way. Alternatively, just put it to the On position, and touch an NFC-enabled device to the left earphone (as I noted, not everything is obvious). This should then pair automatically, subject to a prompt on your mobile device. I had mixed success with NFC. A Sony Xperia T smartphone failed twice, with a message “Could not pair Jabra Revo”, but worked on the third attempt. A Nokia Lumia 620 worked on the second attempt. More than one device can be connected simultaneously, though only one at a time will play. I found this worked; I could play music on one device, then press play on another device and it automatically switched. The good news is that Bluetooth audio worked well for me, with no skips or stutters, perhaps thanks to Jabra’s long experience with mobile communications. Volume was low to begin with, but note that the back of the right-hand earphone is also a touch volume control, and with a few strokes you can get more than enough volume. There are also buttons at the centre of each earphone. The right-hand button is multi-function, and does play/pause, or answer/end call, or reject a call if you hold it down, or redial last number if you double-tap. The left-hand button is for the Jabra Sound App for iOS or Android. It is meant to launch the app, but this did not work for me with the Sony Xperia. If you want to use the headphones wired, just plug the audio cable into the headphones. No battery power is required. If you want to use them as a USB device, attach the USB cable to a computer, wait for the drivers to install, and it works. I tried it with Skype and got reasonable results, though the microphone quality is less good than that of the headphones. If you have an Apple iOS or Google Android device, you can download the Jabra Sound app. This is a music player which claims to optimise sound for the headphones. The app is free but requires a code, supplied with the headphones, to activate it. Using the app, you specify which Jabra headphones you are using. Next, you can set Dolby Processing, Mobile Surround, and Equalisation. If you turn Dolby Processing off, the other options are disabled as well. I am a sceptic when it comes to this kind of processing, and the Jabra Sound app did nothing to convince me that it is worthwhile. I listened to I.G.Y. by Donald Fagen, which is a well-recorded track, and found that adding “Mobile Surround” made it noticeably worse, less natural and less clear. The equalizer could be useful though, particularly as the Revo are not the most neutral headphones I have heard. Jabra Sound is a music player and only works with local music files. You cannot use it with Spotify or Google Play or other streaming services. The comfort of these on-ear headphones is good, though tastes vary and I found them just a little stiff. Then again, wireless implies mobility and a firm fit is no bad thing. How about the sound? There are a couple of points to note. First, all connections are not equal. I found that the wired connection sounds best, followed by the USB connection, followed by the wireless connection. That does not mean that wireless sounds bad, but I did find it slightly grainy in comparison. Only slightly; if you think Bluetooth audio means low quality sound, think again. Second, the Revo seems to accentuate the bass, a little too much for my taste. This may be good marketing as many people seem to prefer this kind of sound, but if you want to hear what the mastering engineer intended you may prefer a more neutral sound. These points aside, the sound is sweet, clear and refined. They are not reference quality, being easily bettered by, say, high-end Sennheisers, Judged purely on the basis of sound quality for the price, the Revo is nothing special. On the other hand, this is a bundle of smart technology, considering that it is also a wireless headset with a built-in touch volume control. This makes it hard to make a fair comparison. 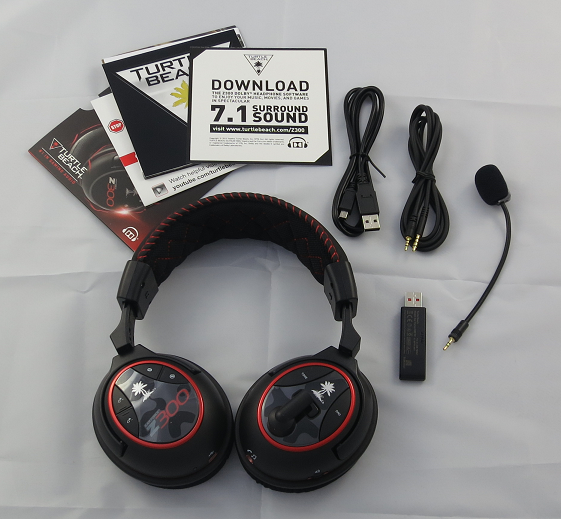 Given the capabilities of the product overall, the sound quality is decent. I have mixed feelings about the touch controls. The ability to control volume and skip music tracks using taps and strokes is elegant, but inevitably there is more scope for mis-taps than with conventional buttons, and I found the volume control imprecise. That said, it is great to have volume and play/pause on the headphones themselves. The Revo has a lot going for it. Elegant design, high quality construction, good wireless performance without any skips or stutters, and unmatched flexibility – remember, this is a headset that you can use for phone calls as well as for enjoying music. On the negative side, the tonality is a little bass-heavy and the sound quality good but no better than it should be considering the premium price. If the flexibility is something you can make use of, the Revo is a strong contender. I travel a lot and use a tablet rather than a laptop, and have gone through numerous Bluetooth keyboards. These are a necessity for me, since the tablet I use is either an iPad, which has no USB slot for a wireless transceiver, or a Windows slate that has only one USB slot that is often occupied. It is surprising how much can go wrong. Some of the issues I have had (NOT with this keyboard let me emphasise) are keyboards turning themselves on in your bag and performing random actions; keys physically coming off the keyboard while in your bag; and tedious reconnection attempts when the Bluetooth pairing somehow breaks. Another annoyance is that most Bluetooth keyboards can only pair with one device, forcing you to re-pair every time you switch. Not any more. Logitech’s K811 keyboard can be paired with up to three devices simultaneously. The first three function keys across the top of the keyboard select which one you want to use. This keyboard is designed for iPad, iPhone or Mac, but I found it also worked fine with the Windows tablet subject to few annoyances (keys that are incorrectly marked). Specifically, on Windows all the alphabetic keys work correctly, as do the numbers, and most of the special characters. The main issues are that backslash types # but can be found on the § key, and @ and ” are transposed. No Windows key of course, but Ctrl-Esc works. Really not too bad. Note that there is a PC version of the keyboard, called the K810, which seems similar but is a little cheaper. So get that if you only have PCs, but if you have a mix of devices, the Apple one is fine. While the keyboard is probably not a good choice if you only use a non-Apple tablet, if you have a mix then it can still be useful. This is a standard Mac keyboard though too small to have a separate numeric pad. The function keys default to the special functions, like dimming the backlight, and you have to press the Fn key to get the standard functions. Physically the keyboard feels sturdy and well-made though it can flex just slightly in the middle since it has four small rubber feet. This did not cause me any problems. The keyboard is big enough for typing at speed and in comfort, and small enough that it tucks easily into most bags. It is 29cm on the longest side. There are some little details that I like. The Connect button can be depressed easily with a finger, no need to find a small pointed object, though I have never pressed it accidentally. There is an on-off switch that is unlikely to slide by accident, avoiding those bag-typing problems mentioned above. The keyboard has a built-in, non-replaceable rechargeable battery, charged via a USB cable. Battery life is said to be 20 hours of typing with the backlight on, or an impressive one year with the backlight off. You can adjust the brightness of the backlight using the function keys, though it resets when you next switch off and on, so you will probably end up with the backlight on most of the time, though it does dim automatically if you do not type for a while. The coolest feature is a sensor that detects your hands and turns the backlight on, if the keyboard has been idle, before your hands touch the keys. A bit of a gimmick, but you can’t help admiring it. Bluetooth switching really does work. I tried a test with an iPad and a Windows tablet. Press the key for the 1st device, and typed text appears on the iPad. Press the key for the 2nd device, and typed text appears on the Windows tablet. Reconnection seems quicker than average. Overall I love the keyboard, and recommend it. I would have liked a protective bag to help prevent damage to the keys when loose in a larger bag, and suggest care with this as it is a common problem. If you just want a keyboard for an iPad, you might be better off with one of the Logitech keyboard covers. If you have several mobile devices though, this is great, with a quality and convenience that justifies its price. Problem: you want to play audio from your mobile device on powered speakers or through your home hi-fi. Usual solution: connect a cable from the earphone socket on your device to the powered speakers or to an input on your hi-fi. That is a little fiddly and untidy, so how about a wireless solution instead? This is where Bayan Audio’s StreamPort Universal comes in. This little USB-powered box in effect enables any audio system for Bluetooth. Simply connect the output from the StreamPort to your hi-fi or powered speakers, using either a 3.5mm jack socket or right and left phono sockets, and then pair it with your mobile device. Audio output is then redirected to the StreamPort and you can enjoy the music at full quality. In my tests the StreamPort worked exactly as advertised – well, nearly. You put the StreamPort into pairing mode by holding down power for 8 seconds. A Sony Experia T Android phone connected easily, I fired up Google Music, and was able to play one of thousands of tracks at what sounds to me very decent quality. Next I tried an Apple iPad 2. Again, it paired first time. I started BBC iPlayer and was able to watch a recent broadcast with excellent sound over hi-fi speakers. A Windows 8 tablet also worked well. You can pair up to four devices, but only one at a time will be active. If the “wrong” device grabs the connection, turn Bluetooth off on that device. If you pair a fifth device, it will simply forget one of the other pairings. So what didn’t work? Well, the StreamPort supports NFC Secure Simple Pairing, which means you can connect a device simply by tapping it. I tried with the NFC-enabled Xperia T and got the amusingly polite message, “Unfortunately content sharing has stopped.” I am not sure whether this should have worked, but I put the failure down to this being a relatively new protocol; perhaps it would work with the newer Xperia Z. Note that Apple devices do not currently support NFC at all. I also experienced very occasional audible stuttering, which is unfortunate, though most of the time everything was fine. Still, this could be annoying. I heard it on music on the iPad and on the Windows tablet, but BBC iPlayer was fine. I guess it may depend on the underlying bitrate and how much data is being transferred. I am reluctant to pin the blame on the StreamPort; rather, it is a common problem with Bluetooth audio, it may or may not be something you experience, and shows that the implementation of the standard (or the drivers) on devices has a little way to go before it is rock-solid everywhere. Is the quality as good as it is through a cable? Generally not, though how noticeable the loss of quality is in the realm of “it depends”. It is a digital connection, so in some circumstances (if the analogue output is poor) it could be better. Bear in mind that if you are using a mobile device as the source, you are probably not looking for the best possible sound quality; but you will probably be pleasantly surprised by how good it can sound. The actual quality will depend first, on the quality of the source, and second, on what audio protocol the source negotiates with the StreamPort. Bayan states that best quality will be from Bluetooth devices that support aptX compressed audio. The protocol used is generally invisible to the user, so all you will notice is how good it sounds. Generally a more recent device will sound better. At a minimum, your Bluetooth source has to support version 2.1 and the A2DP profile, otherwise it will not work at all. In the box is the StreamPort, two audio connection cables, a USB cable for power, a USB mains adaptor, and a brief manual. Two final thoughts. One is that Apple has its own AirPlay system for wireless audio; but thanks to the rise of Android we are seeing more Bluetooth audio devices coming on the market. Since Apple devices work with Bluetooth audio, but Android and other devices do not work with AirPlay, this is an obvious response to demand. Second, it is reasonable to expect Bluetooth audio to be built into an increasing proportion of new playback equipment. Of course, in this case you will not need the StreamPort. It is not that common yet though, which makes the StreamPort a handy accessory. Recommended. X-mini makes a popular range of what it calls Capsule Speakers, the latest of which doubles as a wireless speakerphone for your mobile, thanks to Bluetooth connectivity. Essentially, your smartphone sees it as a Bluetooth headset. First though, a word or two about the distinctive design. In the box you get the X-mini KAI, a USB charging cable that also has an audio cable for play-as-you-charge, a handy soft drawstring bag, and a tiny instruction manual. The X-mini KAI measures around 6cm in diameter and 8cm high when expanded. However, you can also push down the concertina and twist left to lock, whereupon it is just 5cm high. You can play it in this mode, but it sounds pretty bad. Still, easily small enough to put in your pocket. Fit and finish is OK but could be better. Locking the unit shut takes some force and is slightly awkward because of all the switches. The multiple switches and ports do slightly spoil the appearance of the device and are somewhat fiddly to use. So how does it work? First, charge it via any USB connection. It takes at least 2.5 hours to charge fully, for which you get up to 8 hours of playback. Once charged, you can use the KAI in several different modes. There is a three-position switch. Centre is off, or push left for wired audio, or push right for Bluetooth. In wired mode, you can use the short 3.5mm jack connector which is coiled neatly in the base to connect to a SmartPhone, iPod, MP3 player or any audio device, and play your music. There is no volume control on the KAI in this mode, just control it from the audio device. The sound is mono of course, but not bad at all. You have to be realistic about what you can get from such a small speaker, but it is far better than the tinny sound you will hear from built-in speakers on phones and tablets. I used it with the Google Nexus tablet with success. The Nexus is excellent for portable entertainment, particularly if you hack it a little to support Adobe Flash. Combine it with the KAI and you get much better sound from Google Music, BBC iPlayer, YouTube and the like. X-mini quotes speaker power of 2.5w, frequency response of 100 Hz – 18 kHz, and distortion of less than 0.3%. Unfortunately these figures are meaningless without qualification; frequency response for example should be quoted as plus or minus 3dB or some such. Still, with devices like this it is the experience that counts, since we are not talking hi-fi exactly. The KAI is a lot of fun, punchy and clear, you can hear a little bit of bass, and transforms the sound on your mobile device into something you can actually enjoy without earphones. I compared the KAI to my trusty Creative Labs TravelSound. I give the nod to the TravelSound on sound quality, though the KAI was not embarrassed. However, bear in mind that the TravelSound has two speakers, is too big for the average pocket, and eats batteries unless you also carry a mains adaptor with you. KAI wins on convenience. You can also wire two or more KAIs together for better sound, though I was not able to try this. The KAI also works over Bluetooth as mentioned above. To get this working, you slide the Audio key to the right. Then go to your mobile device, enable Bluetooth, and search for available devices. All going well, it will find the KAI and connect. This worked fine for me on the Nexus and on a Nokia Lumia 800 Smartphone. Once connected, audio plays back through the KAI. It is as simple as that, and although there is some theoretical loss of quality, I did not find this audible on a casual comparison. Your battery will run down a little faster on both devices, but other than that it works just the same. What’s nice about the wireless connection is that you can move your mobile device around the room and playback is not interrupted. The range is given as up to 10 metres, by which time you will hardly hear the KAI whether or not it is maintaining the connection. I tested this by walking around and the results were good. In wireless mode an additional control on the KAI comes into play. Press down to play or pause. Move briefly right or left for previous or next track. Move and hold right or left for volume adjustment. You can also use the KAI as a speakerphone, and I tested this with an incoming call. When you hear the ring, press down the control above to answer. The music will pause, and you will hear your caller through the KAI. You can end the call by pressing the same control. The snag with the call though was that my caller said I was hard to hear. I could fix this by holding the KAI close to my mouth but this was disappointing. There is a mute button on the device, but note that this does not mute your voice when in a call. Rather, it mutes the speaker in the same way as during any audio playback. This is a great little device, ideal if you want a very small and portable travel speaker that still sounds decent. Bear in mind though that the X-mini capsule speaker is also available in a wired-only form for around a quarter of the price, so you are paying a lot for the Bluetooth and speakerphone features. The wireless audio works really well, but the microphone seems insufficiently sensitive when used as a speakerphone and I would not want to use it for conference calling. That is a shame since this is otherwise a compelling feature, unless I was unlucky with my sample. The review unit was supplied by Phone4U and you can find it here, price at the time of writing £79.99.